What happens when three blues guitarists meet during a Jimi Hendrix tribute tour and discover that they naturally share musical kinship? They get together as a supergroup, write some songs,and record an album. That is exactly what happened when David Hidalgo of Los Lobos, Luther Dickinson of the Black Crowes, and Mato Nanji of Indigenous met on the Experience Hendrix tour. Together the three guitarists created 3 Skulls and the Truth, a hard-driving blues collaboration with plenty to offer. These guys met on a tour celebrating Jimi Hendrix, so you can pretty well imagine what kind of music these three guitar virtuoso’s would create together. A lot of psychedelic blues mixed with some pure, greasy blues that echoes not only Hendrix but some early ZZ Top. Not surprising as Billy Gibbons loved Hendrix and opened for him as the leader of the Moving Sidewalks in 1968. But I digress. The group is rounded out by the session rhythym section of drummer Jeff Martin and bassist Steve Evans. The material is all written specifically for this recording with contributions by all three guitarists. A lot of the time three guitarists can sound cluttered together and it does not mesh well. This is not one of those times. The three work with each other while showing off and keeping things tight. The first track, “Have My Way with You,” features Dickinson’s gritty blues lyrics and delves into a nice instrumental. “All I Know,” is a great blues boogie with lyrics by Nanji and Hidalgo, and nice slide by Dickinson. The highlight may be “The Worldly and the Divine,” which is a great blend of blues, roots, rock, and some psychedelia which teeters on the edge of control, but never goes over it. Range is further demonstrated by the funky tunes, “The Truth Ain’t What It Seems,” and the closer, “Natural Comb.” The former explodes at the start and ends up moving in a myriad of funky breaks by Martin and stays together the whole time. The latter is slow blues that allows the guitarists to solo and work out together while the lyrics maintain a lighthearted feeling to the song. 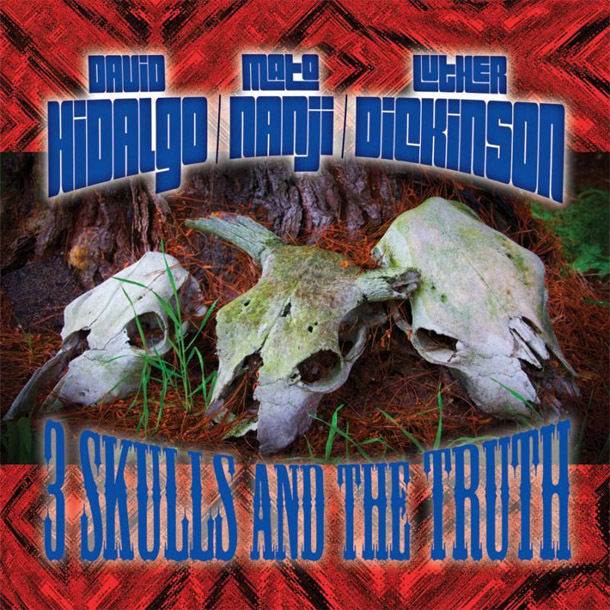 3 Skulls and the Truth may have started as a one-shot deal by three blues rockers brought together by a love of Jimi Hendrix, but this album demands more. The three guitarists work well together, they do not compete with each other, although there is plenty of soloing. The compositions original for the album are for the most part very strong and benefit greatly from the diversity of the singers. The music is like early 70s ZZ Top crossed with some modern blues. They understand that the music is dynamic and they boogie. The artists know that the blues and boogie are not nostalgic genres, but still dynamic and capable of great things when done right. This album is done right. This album is awesome…highly recommended. Totally digging this recent discovery! Big fan of Luther Dickinson and his work with North Mississippi Allstars and …well, lots of other great musicians! This recording has Jimi Hendrix woven all through it, very happy enjoying the talent this group has!